Each of the 20 luxury cabins has unobstructed views of the valley. On the private wooden terraces, guests can sit under a blanket of stars and sip regional wines while being warmed by a roaring fire. Minimal and understated the cabins may be, but modern comforts and deluxe touches have not been overlooked. Monochromatic and with an edited selection of furnishings, they provide comfortable spaces for retreat. From the pool, guests can soak up the calming solitude, while gazing out over the vast expanse. And although the location is remote, the onsite restaurant and bar ensure every comfort is met. 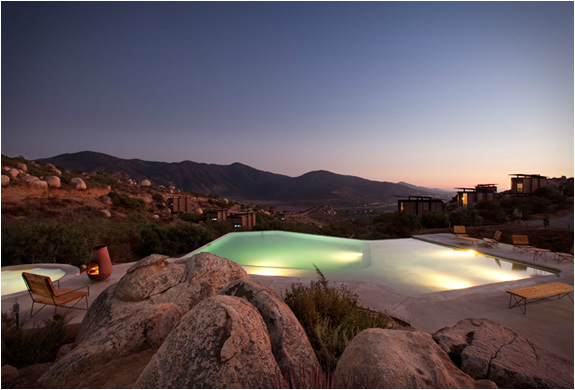 Endémico is situated in the village of Valle de Guadalupe, just one and a half hours from San Diego, California.